Trusted Tampax protection - with the original Tampax. Comes with an open-ended flushable and biodegradable applicated for clean, easy disposal. Moisture-lock protection, naturally absorbing fibers help hold moisture in, giving you the kind of protection you have come to trust in Tampax.Trusted Tampax protection - with the original Tampax. Comes with an open-ended flushable and biodegradable applicated for clean, easy disposal. Moisture-lock protection, naturally absorbing fibers help hold moisture in, giving you the kind of protection you have come to trust in Tampax. They are what they are, but what's nice about this is that it's really hard to find 40 packs elsewhere. I like this product . It is very comfortable and the applicator is easy to use. This is a very good product. 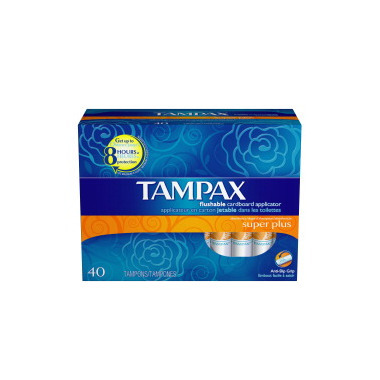 I have been using tampax tampons for the last 20 years and as usual these are like the rest a very good product. This product has worked without fail for me for over 20 years. I prefer the cardboard applicator instead of the plastic for two reasons: environmental and practical. The cardboard applicators eventually break down in a landfill. As for the practical reason: a man must've designed the plastic applicator... it has teeth! The cardboard applicator version is almost impossible to find in Edmonton (Alberta) now, so I get my supply from well.ca and tell every store manager they're losing out on sales to well.ca.